I swear May should be re-named May madness. It’s almost worst than December. This month has been non-stop and it’s only the middle of the month. I seriously can’t wait for summer and this is the first year that I can truly say that. I can’t wait to sleep in, kick back with the kids and just chill at the pool. I may even chill out with one of these smoothies. Anyway, amongst all this madness of racing to and from everything, I want to give my kids a healthy snack where I can. The weather has been warm and summer-like lately so smoothies are back in my kid’s radar. They love this spinach smoothie as well as this spinach one, but sometimes they want a good old-fashioned creamy smoothie. Who can blame them? 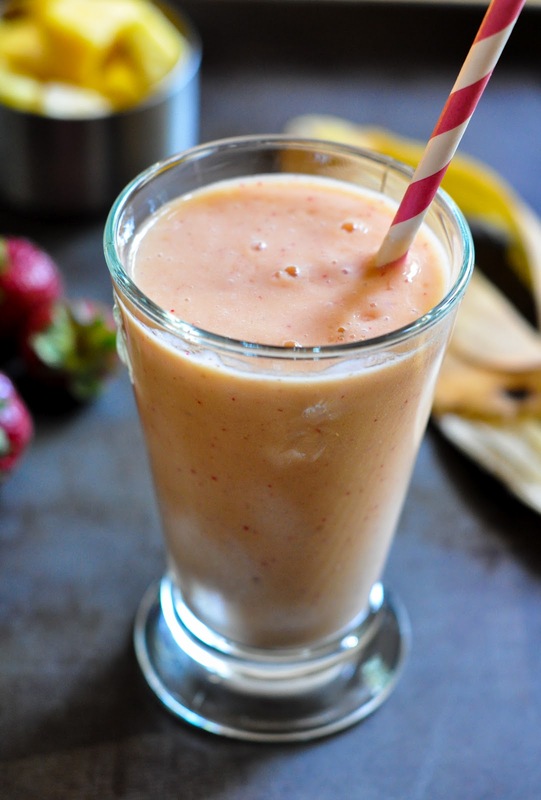 This is an easy smoothie to throw together and is perfect this time of year as strawberries are at their peak! 1 cup frozen mango – you can use fresh as well, but make sure you throw in some ice cubes. 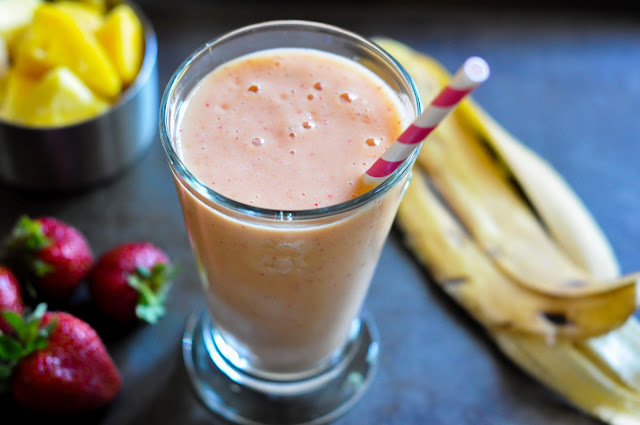 Get out your blender and throw in the orange juice, Greek yogurt, mangos, strawberries and banana. Give it a whirl until blended. Pour the smoothie into two 9oz glasses, add a fun straw, and call in the kids! 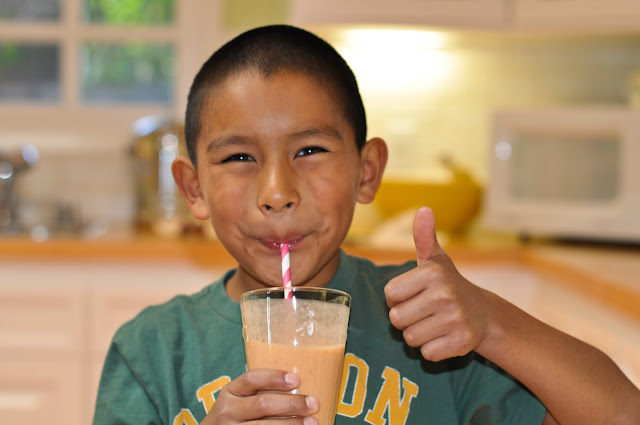 Eli gave this smoothie a thumbs up! Summer here we come! We love pairing this smoothie with our favorite popcorn. Spinach Smoothie! Kid rated 10! 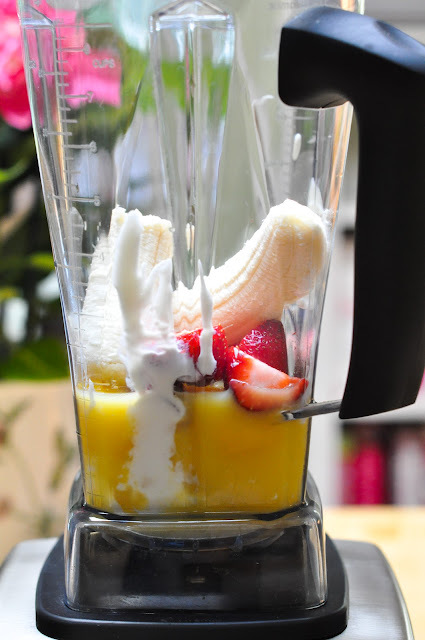 I love smoothies! I’m not a huge fan of mango but I would definitely give it a try! And with a smile like that who could fail to take Eli’s recommendations seriously! :).